Despite giving up a serious cubic-inch advantage to much of its competition, the Ford modular engine platform is one to be taken seriously. Developed in 4.6L and 5.4L, two- and four-valve configurations—and more recently the four-valve 5.0-liter Coyote and 5.2-liter Voodoo designs, the modular engines combine deep-breathing abilities with overhead-camshaft high-winding RPM capabilities into a package which fits under the hood of late-model Mustangs and other Ford vehicles from the past several decades. 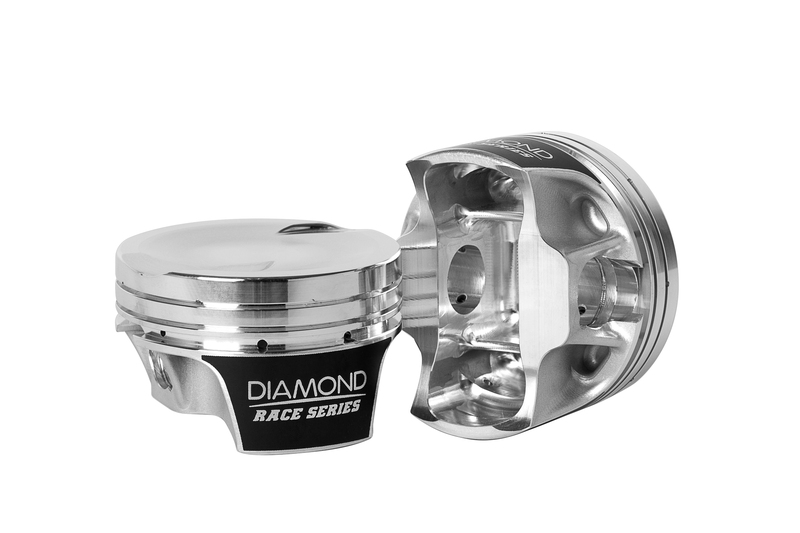 The Diamond MOD2k piston line is based on a dedicated forging and is designed to accommodate forced induction application up to 2,000 horsepower! The engine platform benefits best when subjected to substantial boost application, especially in the four-valve and 5.0/5.2 realm, as the extended powerband stretches well into the 8,000-and-up neighborhood when the engine is properly equipped to do so—and that's where the team at Diamond Pistons enters the picture. Such high-RPM capability requires robust components that are specifically designed to handle the stresses of the elevated piston speeds which occur in the stratosphere. The company has recently completed the incorporation of its MOD2K piston line, which is designed specifically for these engines to achieve 2,000 horsepower without concern for the piston construction failing at high boost levels. “After Diamond's release in 2018 of the industry-first 2,000-horsepower-rated LS pistons, the modular community burned up our blog and social media showing interest in that same design piston for the modular platform. 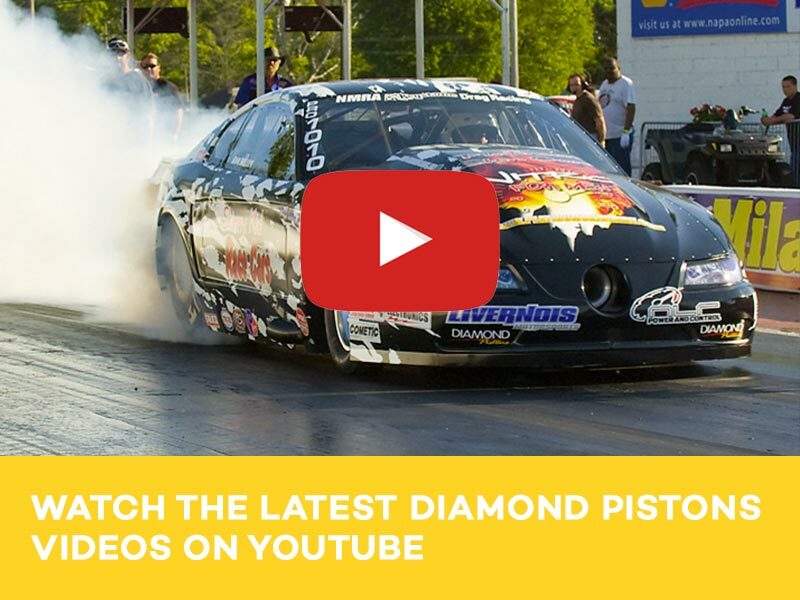 We listened to what the racers and builders desired, and went to work designing the MOD2K 2,000hp-rated modular piston line,” says Mike Panetta, Diamond's Sales/Product Manager. Available for several different modular engine applications, the MOD2k line is packed full of strength-enhancing features such as extra-thick crowns, ring lands, and skirts. So what makes these so special? 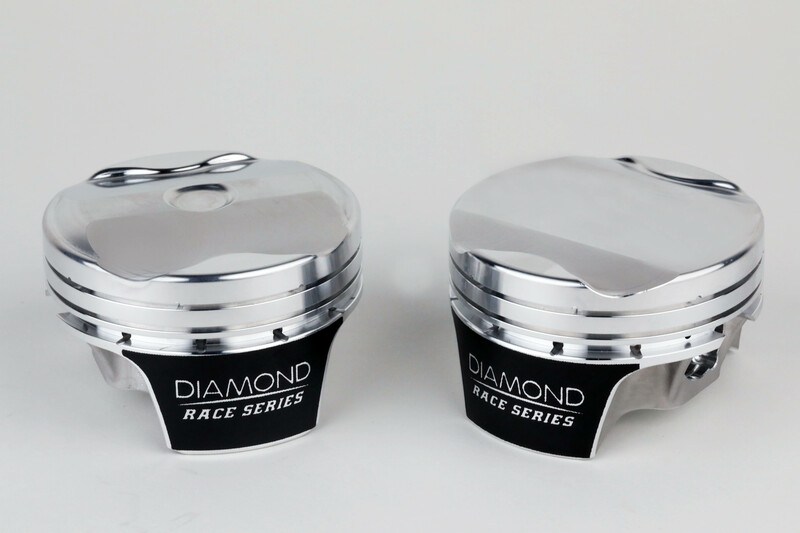 First off, the fact that they are stocked on the shelf at Diamond so that you don't have to wait weeks for a set of custom pistons to be manufactured is extremely attractive. In the past, pistons with power-handling capability like that baked into the MOD2K line would have required a custom order and several weeks of lead time for manufacturing. Rather than leaving these things to chance, Diamond's engineers looked at the most popular and important options which would typically be ordered in a piston of these capabilities, then designed a piston which is on the shelf in all of the popular bore sizes. This way, racers don't need to stress over an unplanned mid-season freshen-up; they can just call and get a set of MOD2K pistons shipped right out, and be comfortable in the fact that the pistons will perform exactly as advertised—handling big power with zero issues. “The MOD2K series comes standard with fully machined under crown, crown and skirts. The piston kits are ready to use, there are no additional machining or finishing processes required when you receive these piston sets,” says Panetta. Premium Total Seal AP ring set included. The use of forged 2618 aluminum alloy material is also an important part of the process. The 2618 material is more ductile, which means that if it is abused, it will be far more likely to deform rather than have a piece (or pieces) break off and further damage your engine, like what can happen with pistons manufactured from high-silicon 4032 aluminum alloy. The 2618 alloy also resists cracking and tolerates the high cylinder temperatures seen with big-boost engines. Today's computer-aided design software gives Diamond's engineers the ability to visualize the stresses that a piston will undergo in operation, and it's because of this ability that they've outfitted the MOD2K pistons with all of their best features to withstand the abuse these pistons will likely see. Extra material has been engineered into the piston crown, skirts, and wristpin area, as these are the locations on the forging which see the highest stress levels as the piston rockets up and down the bore at 8,000-plus rpm. According to Panetta, the company's 3-D milling capability means that the piston crown and valve pockets are completely finished and ready to install; in the past, your engine builder would have likely needed to spend some time preparing the piston tops by removing burrs and other sharp edges, which can create hot spots during engine operation. The 3-D milling process removes that extra step from the equation, meaning that these pistons are ready to go when you open the box. The undersides of the crowns also feature precision milling to reduce weight where it is not necessary, while retaining thickness in the important areas of the piston's underside. Diamond's 3D milling process produces a beautiful, ready to run art with no demurring or hand-finishing needed. 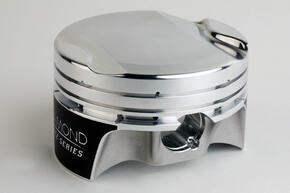 MOD2K Pistons will be on the shelf, ready to ship! Additionally, during the machining process, struts are left in place where the engineers have determined they are critical: from the outside of the pin boss to the underside of the piston top, just outside the pin hole, and also on the inside of the pin bosses, from side-to-side. By boxing in the boss area this way, support is greatly increased, but with a minimum of added weight. These pistons feature a slipper skirt style rather than a full-round skirt, so the extra strength is welcome. And since we all know that the Coyote likes big RPM levels, a reduction in weight—without a corresponding reduction in strength—is a win-win for everyone. The racer gets a piston which can handle just about anything they choose to throw at it. Lateral gas ports are standard as well; for the uninitiated, a lateral gas port is a small hole drilled into the piston in the top land, above the ring. As the combustion pressure travels down toward the ring, it is forced through these holes to allow extra cylinder pressure to reach the back side of the top ring, and the face of the ring is pushed out to the cylinder wall to provide better ring seal. During the compression, combustion, and exhaust strokes of the piston, the top ring relies on this pressure to help it seal the cylinder up. As the Coyote typically uses at most a 1.5mm-wide top ring—and many full-on race engines use top rings which are much thinner—the extra cylinder pressure to improve the ring's radial tension is welcome and appreciated. By design, thin rings can only have so much radial tension, and the gas porting assists in the ring seal by using the engine's own byproducts. Under-crown milling reduces unnecessary material while strategic struts help reinforce critical areas of the piston's crown, pin-bosses, and skirt. 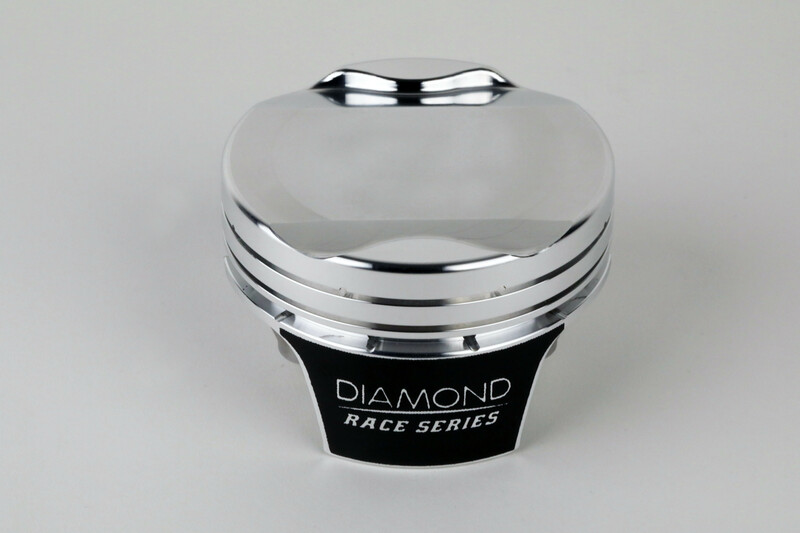 Friction reduction is always a key factor in racing engines, and to that end Diamond has chosen to apply its moly coating to the major and minor thrust surfaces of the piston skirts on the MOD2K pistons. Not only does the coating help to reduce friction, it also reduces the chance of skirt scuffing on dry startups—like those which can occur after a long layoff between races—and prevents premature skirt wear. In any performance build, wrist pin choice is important; the pin is the one component which keeps the piston securely attached to the connecting rod, so ensuring that it is of sufficient quality is a crucial decision. In keeping with the top-quality design of the MOD2K platform, Trend Performance's H-13 tool steel, .250-inch-thick-wall piston pins are shipped with every set of pistons. H-13 is considered an excellent choice for power-adder engines, and if necessary, DLC-coated pins can be substituted into the order. Stainless steel wire locks are also included. Not to be considered an afterthought, Total Seal AP stainless rings are included with every set of MOD2K pistons as well. These rings, manufactured from 440B stainless steel, are designed to be easier on cylinder walls and conform easily to provide superior sealing. 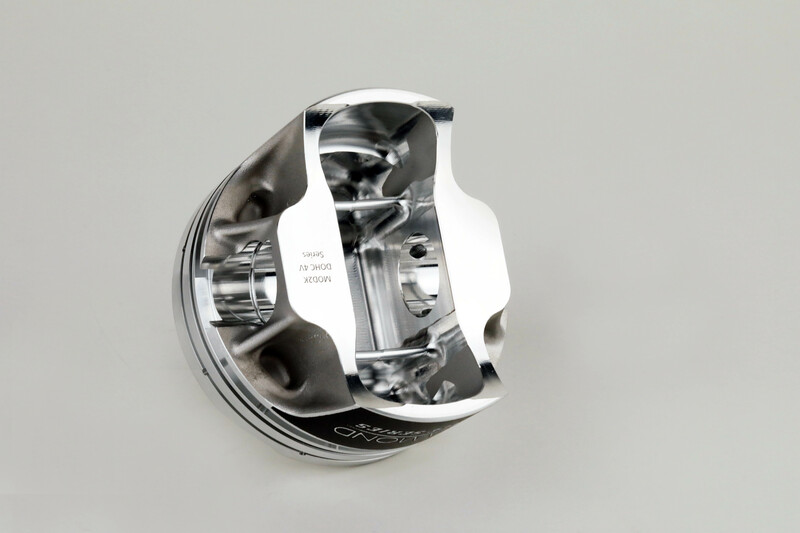 “This line was designed from years of custom piston development. It was a work in progress from what we knew worked and didn’t work at these power levels. We used this design in multiple builds over the years before turning it into a shelf stock offering,” says Panetta.